I know I should be wrapping up all the 9th Wonder-Related Stuff before I start making other Hip Hop posts but I feel that this album is more appropriate to put up right now since I’ve been so much of a procrastinator of late. 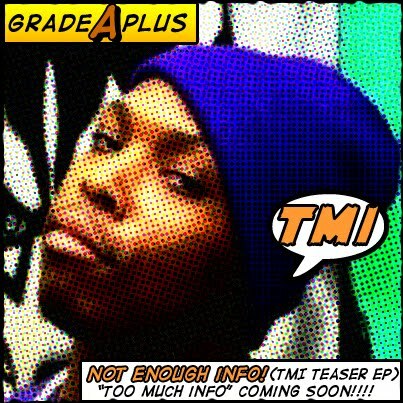 Grade Aplus and his self-proclaimed “Quality Slacker Hip Hop” hail from Bellwood, IL which is also home to the legendary (and HIGHLY under-appreciated) rappers of the now defunct group Rubberoom. Grade makes unorthodox, braggadocio, self-deprecating, mainstream-tinged underground Hip Hop that couples a sense of humor with a serious approach. Much like his fellow ‘Woods native SHOW, Grade Aplus is able to inject some fun into his music without making it too frivolous as he tackles subjects such as video games, cartoons and junk food. What more could a slacker ask for? Don’t let the genre tag fool you though, this kid definitely has the drive (and the skills) to go somewhere, and his music is highly infectious and highly recommended.